Last winter I created a beautiful morning routine. After dropping my daughter at school, I’d drive to a nearby hilltop overlooking the beach and meditate before going home to work. The sight of the sparking sea lifted my heart, the noise of the waves grounded me and the smell of salt calmed me. That ocean-based routine helped me create space in my busy life, stay more focused for the rest of the day and endure a breakdown. Wherever I travel I seek out water. I love the ocean, especially when the waves are crashing, but waterfalls bring me as much, or more, energy and joy. Is water the simple secret to happiness? That’s what I started wondering after reading a beautiful essay about water by fellow Aussie travel writer Louise Southerden. Swimming in the sea is bliss but I’m equally happy floating down a lazy river. When all else fails a long soak in a hot tub is one of my favourite self-care treats. Californian marine biologist, cognitive researcher and author Wallace J Nichols has written a book called Blue Mind proposing that we humans all have a blue mind. Nichols believes we’re all programmed to enjoy and benefit from being close to water and in contact with it. “our brains are hardwired to react positively to water, and being near it can calm and connect us, increase innovation and insight and even heal what’s broken”. We all know that water is essential for the body and we need to drink plenty of it, but maybe water is just as essential for the soul as it is for the body. Maybe water is the simple secret to happiness we’ve all been looking for. So with that in mind, why not seek out water every day? Or twice a day if you can. Lake, ponds or an Australian billabong. Water is a sensory experience, an instant lesson in mindfulness. Maybe that’s why we love water so and so many of congregate at the beach or other bodies of water. Next time you need revitalizing seek water, sit down and soak up the sights, sounds and smells. If you can take a swim and feel water’s gentle embrace. Or at least pause a moment in your busy day, fill a glass of water, drink it in with your eyes first and then sip it slowly. Whatever you choose to do, the secret to happiness is being present, right there, in that moment. Do you think water is the secret to happiness? What’s your favourite water fix? Yes I share that attraction to water. Annabel. The ocean was such a soothing force that helped me through a most difficult time last year. I love to stand at Main Beach in the pouring rain. Very invigorating and energising. I love water too, Annabel. It brings me so much relaxation and therefore also joy and happiness. I think genuine happiness goes beyond water, but water for sure can feed our soul. What an interesting perspective, and it really makes sense! Our bodies are basically made of water, so no wonder we all feel at peace when we are near it. I love the sound and feel of water in so many forms. Nothing beats the meditative sound of a downpour with some thunder and lightning mixed in. I’m so looking forward to spring… the snow is too silent and cold. I so share your affinity with water, Annabel! I live in a very urban environment, a courtyard apartment in Los Angeles. Every day at 5 pm, the courtyard fountain starts gurgling and it makes me so happy. I wish they’d run it all day! Thanks for this. You’ve made me realize I really need to get a tabletop fountain or something similar. Oh that’s a lovely story – I hope you find something. Failing that there are some great audio CDs with sounds of crashing waves and the like! Annabel, floating in our pool has become a real treat for me. It wasn’t until a cousin said it could be meditative I started doing it. Now I free float, try not to think too much and enjoy. A nice end to a swim. 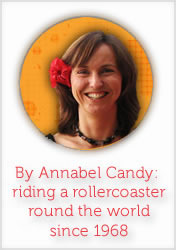 Hi Annabel- Totally agree with this post! I always thought the reason why we centered our holidays around water (no matter where we go!) was because we hail from Florida, but our bodies are 90+% water, right? Maybe it’s a law-of-attraction thing and the water draws us to it! Whatever it is, jumping into oceans, playing in creeks and gazing a waterfalls r definitely the way to peace-of-mind! What a beautiful post! I have always felt the most at peace on the water, and now that we are living on a sailboat in Galveston Bay, I feel more at ease than I ever have. You are right–water is the secret to happiness.